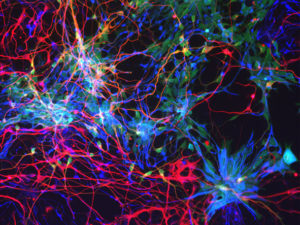 The major research goal in our laboratory is to understand the molecular and cellular mechanisms underlying the development and evolution of the cerebral cortex, from stem cells to neuronal circuits, from mouse to man, in health and disease. The cerebral cortex is one of the most complex and important structures in our brain. In correlation with its elaborate functions, it is made of dozens of distinct types of neurons that display specific patterns of gene expression and synaptic connectivity. Moreover the cortex underwent a major increase in size and complexity during recent hominid evolution, mostly related to increased neuronal number and connectivity. How does cortical complexity emerge during human development, from early steps of neurogenesis to late steps of neuronal circuit formation? And how did this complexity increase during evolution? What is specific to human brain development and how does it relate to brain diseases? We try to address these fascinating questions using an integrated approach that combines tools of developmental biology, neurobiology, and pluripotent (ESC/iPSC) stem cell technology. Human-specific NOTCH2NL genes expand cortical neurogenesis through Delta/Notch regulation. Suzuki IK, Gacquer D, Van Heurck R, Kumar D, Wojno M, Bilheu A, Herpoel A, Cheron J, Polleux F, Detours V, and Vanderhaeghen P. Cell (2018)173(6):1370-1384. Specific reestablishment of damaged circuits in the adult cerebral cortex by cortical neurons derived from mouse embryonic stem cells. Michelsen KA , Acosta-Verdugo P, Benoit-Marand M, Espuny-Camacho I, Gaspard N, Saha B, Gaillard A , Vanderhaeghen P. Neuron (2015), 85(5):982-97. Pyramidal neurons generated from human pluripotent stem cells integrate efficiently into mouse brain circuits in vivo. Espuny-Camacho I, Michelsen K, Gall D, Linaro D, Hasche A, Bonnefont J, Bali C, Orduz D, Bilheu A, Herpoel A, Lambert N, Gaspard N, Péron S, Schiffmann SN, Giugliano M, Gaillard A, and Vanderhaeghen P. Neuron (2013), 77, 440-456. BCL6 induces neurogenesis through Sirt1-dependent epigenetic repression of selective Notch transcriptional targets. Tiberi, L., van den Ameele, J., Dimidschstein, J., Piccirilli, J., Gall, D., Herpoel, A., Bilheu, A., Bonnefont, J., Iacovino, M., Kyba, M., Bouschet T., Vanderhaeghen P. Nature Neuroscience (2012), 15, 1627-1635. An intrinsic mechanism of corticogenesis from embryonic stem cells. Gaspard N, Bouschet T, Hourez R, Dimidschstein J, Naeije G, vandenAmeele J, Espuny-Camacho I, Herpoel A, Passante L, Schiffmann S, Gaillard A, and Vanderhaeghen P. Nature 455 (2008), 351-357. Preview in Cell Stem Cell.